Have you ever stopped to consider how many kinds of ice cream there are in the world? Vanilla, Chocolate, Strawberry, Funky Monkey, Chai Tea… the list is as endless as one’s imagination! This week, I stood in the ice cream aisle in my grocery store and stared at all the varieties. As I contemplated the relative merit of Triple Chocolate Fudge with swirls of Rocky Road versus a truly luscious French Vanilla Bean to which I could add fresh raspberries and Irish Cream, it occurred to me that this is the same excruciating choice that a modern metalsmith faces when designing a new art jewelry piece. When one considers all the options possible among stone setting, surface manipulation, patinas, different forging techniques- it is easy to understand why the creation of a new design can take days, if not months and years, to complete. I am not by any means a master metalsmith as of yet, but even I personally know hundreds of different ways to create a piece of art jewelry. My personal favorite, of course, are forged precious metals with gemstone accents, but I have large soft spot in my heart for an even more esoteric form of artistic expression in metals, called Mokume Gane. In the 1600s in Japan, a metalsmith by the name of Denbei Shoami invented a way of fusing layers upon layers of alternate metals. He discovered that when one did such a thing, then forged the layered billet into a thinner sheet, then selectively removed portions of the billet, and flattened the whole sheet again, one was left with an amazing amount of patterned beauty. 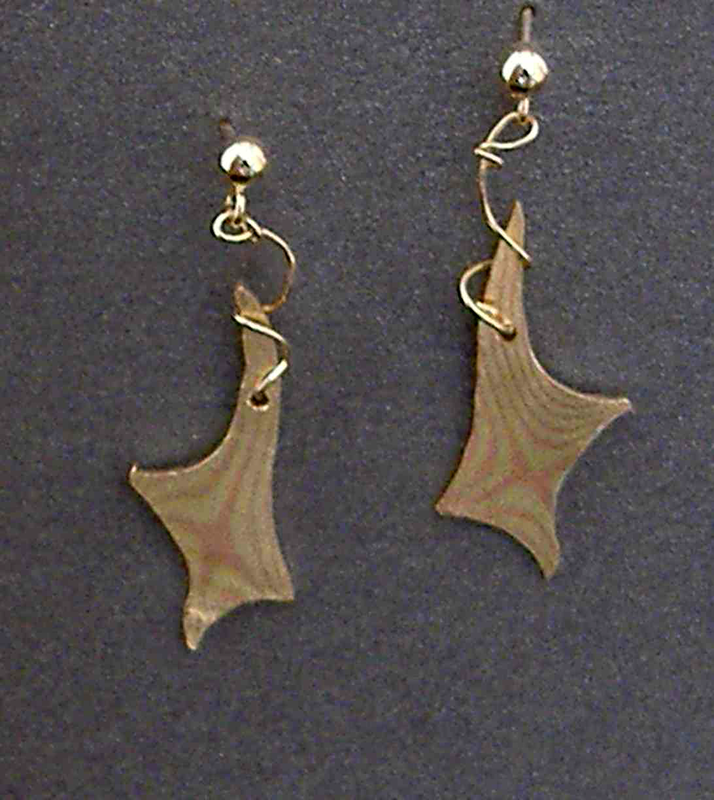 This was named Mokume Gane Jewelry or “wood grain in metal”. He was a master smith, who was adept at the creation of forge-folded swords, or Damascus steel swords, for the warrior Samurai class of Japan. I can only presume through the distance of time that he felt the need of a new challenge as a smith, because the creation of Mokume Gane Jewelry is a lot of work. There are several different methods of creating this stunning mixed metal version of Rocky Road, but all of the methods are time intensive and subject to large amounts of failure.The first step of all the methods is the selection of the metals the artist wants to use. Some metals, such as copper, brass, silver, and certain gold alloys, are easier to work with than others, but the essential first step is the cutting, sanding, and cleaning/degreasing of the surfaces of the chosen metals. These metals are then fluxed, layered, and bound together under pressure. Usually this amounts to a set of iron plates bolted together with the layers sandwiched in the middle. Here is where the methods diverge. The somewhat controversial, yet safer method uses small amounts of solder in between the layers of metal to bond the layers together, as is the case with traditional metal fabrication techniques. The artist doesn’t need to bring the metals anywhere close to their melting points, but is able to stay a comfortable 500 degree distance away from that threshold. The artists who use the more widely accepted Diffusion Bonded method of creating this unusual material, rely on the property of fusion bonding to create their Mokume Gane Jewelry. Once again, a small bit of science is required to explain this process. I’ll make short though, I promise! Certain metals and their alloys have the property of atomically bonding to similarly structured metals under the stimulus of heat and pressure. For example, when you take a piece of pure copper, and rub it vigorously on a steel object, the steel object will have acquired a coppery sheen in the area that was rubbed. This is a very low tech example of how “friendly” copper is with other metals. Most metals are willing to be sociable and friendly under the right circumstances, and there have been many phase diagrams and charts made up by more metallurgically inclined smiths than myself. I highly recommend Mokume Gane by Steve Midgett for those of you who are curious and like to read phase diagrams as bedtime reading material. Of course, knowing what different metals require to be friendly with other metals has generally been a closely guarded secret that has been passed from generation to generation, and from Master Smith to Apprentice, for hundreds of years. It is only in recent years that Mokume Gane has seen a revival of new interest and an open sharing of information across the world. Smiths around the globe are using complicated alloys and fusion processes to combine a stunning array of dissimilar metals such as Platinum with White Gold, and Palladium with Silver, resulting in some of the most stunning patterns of luxury that is available today. So once one determines what metals to use, cleanses them, and binds them together, the whole apparatus is soaked in a hot kiln for hours. For the first method, this causes the solder to flow, easy peasey, and you’re done. For the second method, the atoms on the outside of each piece of metal are starting to merge with the metal atoms of their neighboring pieces, forming a new alloy along their seams – this is the Diffusion Bond I mentioned earlier. This new alloy can be formed with both metals in their solid states, or even in a semi-liquid state. With the new alloy tentatively formed, it’s not quite enough to have this billet of material soaked in heat, and under bolt tight pressure. Now the artist has to force an even more forceful bond. Okay, so now it’s time for my favorite part- hit it with a bigger hammer!! Bashing this innocent block of metals repeatedly with a very large hammer is quite fun, but if the materials have been over heated, this will be the time when molten showers of metal spray in every direction and leave you with several days wasted and an unusable piece of metal. …as much as I love French Vanilla Bean ice cream doused with Irish Cream and Raspberries, sometimes you just need Triple Chocolate Fudge with swirls of Rocky Road. Or a stunning Mokume Gane Jewelry pendant. I love mokume gane the material. It’s very reminiscent to me of forge folded steel. I remember at an NMBA conference sitting entranced watching a blacksmith demonstrate making twisted “Turkish style” Damascas steel from scratch from pieces of sheet mild steel and pure nickel sheet hot forged together in a gas furnace. I don’t have the skills to make Damascas or mokume gane, but I do collect a few pieces here and there. I particularly like what you have done with mokume gane in your jewelry. It take a true artist to take a stunning metal and make it into an even more beautiful art object. Well done! For what it’s worth, as an artist, you don’t have to make mokume gane from scratch. An excellent source of the material is the company Reactive metals. A number of jewelry supply house now offer the material in various patterns too. Notably Rio Grande. My favorite is the “rain drop” pattern.